In Polonia Aero's enormous testing laboratory, testing began on the turbine for the world’s largest commercial jet engine. Less than four years ago, in a place called Zielonka, 20km east of Warsaw (Poland), there was only a forest - of the sort populated by conifers that resembles a Siberian landscape when the winter snows fall - and a nearby military base. It took an investment of 55 million euros to build the largest Cold Flow test facility on the old continent and the efforts of a team of engineers, led by Robert Boroch. 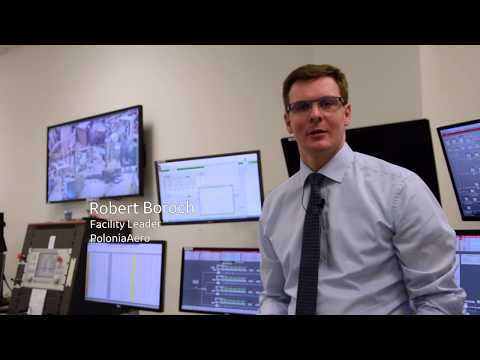 “Polonia Aero became officially operational at the beginning of 2016 and is the most modern plant of its kind in the world. We are proud to begin the first real development test with the GE9X, the new generation of engines for the Boeing 777-X”. Certainly it could hardly be otherwise for Boroch and his team with whom he worked night and day to install and study the characteristics and functionality of this gigantic “test bed”, starting with the GEnx turbine trials. He is now studying in detail one of the components, the LPT (low pressure turbine), for which Avio Aero was not only responsible for designing and manufacturingseveral parts, but is also the module owner in charge of the assembly and delivery to the parent company. The LPT is a core component of an engine that lifts up a multitude of transatlantic and intercontinental flights flawlessly, and, for the GE9X, it will continue the global record of its predecessor the GE90. What is a Cold Flow Test Facility ? In simple terms, it's a facility that simulates the atmospheric conditions of take-off, cruise, and landing in order to test the aerodynamics (on every part of the turbine) and the fluid dynamics (relative to the air flow) of an actual sized or scaled low pressure turbine, in order to isolate the turbine and test its efficiency and performance capability. For the GE9X LPT, real size means a maximum diameter of around two metres. Therefore, to test this component it was necessary to build a mammoth “test bed” installed inside a facility laying on a surface area of 35 thousand sqm, fed by a 45MW capacity electrical power supply. To give an idea of the size: the famous GE gas turbine LM2500+G4, which powers, for example, ships over 140m long that weigh almost seven tonnes, goes up to at the most 35 MW. The Cold Flow simulates the aerodynamics (on every part of the turbine) and the fluid dynamics (relative to the air flow) in order to isolate the turbine and test its efficiency and performance capacity. “We perform tests to ascertain the impact of the noise generated by the turbine on the environment, and to check that the technologies developed for the turbine correspond to the benefits that we want to offer our clients” explains Maciej. The type of testing performed on the GE9X at Zielonka is called aero design and occur during the cruise phase. “While the engine generates a great deal of power on take-off, the majority of the time t in operation at more than 11 thousand metres in the air is actually in cruise. When the engine performs its most demanding task, the turbine must be as efficient as possible, with the lowest possible consumption of fuel. “It is a bit like when you buy a new car” concludes Maciej, “you try to drive it as efficiently as possible, then you try increasing or easing depending on the road conditions ... it's a bit like what we try to simulate here with the air flow”. It seems very simple when put in these terms, but it is a question of interpreting a considerable volume of data relating to the air pressure, and how this affects every single part of the low pressure turbine, as well as studying the physical responses of the individual components of the turbine itself (each blade, stator and stage) to certain atmospheric conditions, to air pressure and temperatures simulated in the test room. Looking at the turbine in the centre of the room, traversed by gigantic air conduits and tubes, you can see circular metallic structures heavily instrumented. This is the Circular Traversing System: mechanical rings that make it possible to automatically position and direct some of the more than a thousand sensors dedicated to the turbine. It is also used to analyse the air flow intake and exhaust on five sections of the main conduit that manages and simulates the flow before and after the turbine (intake and exhaust). The air flow sensors in the five sections send data to the computers and consoles in the control room through sampling frequencies (those that measure signals up to 500 kHz) and can generate 2 to 3 terabytes of data that are then shared and analysed with other test engineers in GE aviation. “We have designed a system capable of positioning sensors with a high level of precision, which can be controlled and monitored from the control room from which the test engineer can manage the entire test bed” explains Alessandro De Grassi, the Technical Manager from the Italian company Loccioni, a leader in the design and manufacture of automatic measurement and quality control systems. Together with Avio Aero, Loccioni has designed and built high-tech test beds that are tailor-made for testing the components and modules of aeronautical engines such as, for example, the TP400 or the Advanced TurboProp. “The Stargate, as we like to call the Circular Traversing System, can adapt to different diameters of the turbine and air conduits, although those of Zielonka are a record in terms of size”. Forces and air flows rapidly flowing, due to inertia; causing friction, vortices, or thickening with the changing flight conditions. Rain, cold, vortices, currents and everything that can occur at high altitudes, higher than Mount Everest or K2, at a speed of over 900km/h...these are the conditions to which a scaled model of the GE9X low pressure turbine is subjected, under incredible forces, which in Zielonka are propagated through a colossal system of tubing which is up to 5 metres high and joined together by enormous hexagonal bolts. Right next the text room there’s the compressor room, the largest in Europe capable of a max mass flow of 80Kg per second. The GE9X test article is the low pressure turbine built to a scale of 1:2 by various design teams located in Rivalta, Bielsko Biala, Brindisi and Zielonka, and requiring a highly precise and accurate level of technical interconnectivity between the technicians involved and with final assembly in Brindisi. Luca Morciano - member of the Brindisi team - explains “In addition to designing it and selecting the most appropriate materials, we have to install a range of sensors along the turbine air flow with absolute precision since they will be crucial for the representativeness of the data when compared with the final design and the real turbine”. Magdalena Sowinska, Design Engineer says “Here in Zielonka we don't only perform tests. There are also CAD designers and stress engineers here that research and design turbine modules and even mechanical transmissions for new products for GE Aviation and other third-party customers”. A strong desire to grow is clearly discernible when talking to the engineers and in particular when listening to Robert Boroch: “In order to broaden our skills and the range of services we can offer, we would like to try and attract gas turbines for power generation and motor engine turbines to our facility.” The giant of the forest is ready for many other testing.